Artists Statement: I have painted and drawn all of my life. I have given up working as a jewellery designer, and have been concentrating on painting the last 4 years. I still enjoy beautiful lines and try to instill some of the excitement I feel from nature. 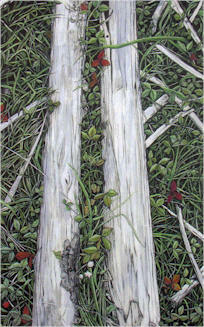 This particular painting was done in the Valhalla mountains and is part of a series of “groundscapes”. At the present time I am working on a series of paintings of my dog and cats.